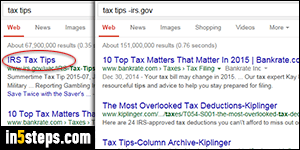 A previous tutorial explained how to only show Google results from a specific site. Now I'll show you how to exclude some specific terms from the search results, or even exclude results from sites you're not interested in. 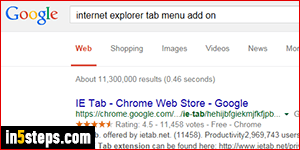 Perfect application for this trick: searching for a tabs menu add-on for Internet Explorer (Microsoft removed that menu from later versions) keeps showing unrelated results for a Google Chrome extension, which happens to be called "IE Tab". 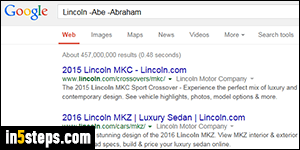 The nice thing is that Google operators can be combined: you may already know that placing terms in double-quotes tells Google to search for that exact match: in other words, typing the word Abe and the word Lincoln in the search box tells Google to search for pages that contain both of these words ("Abe Johnsons drives a Lincoln" would be a valid match). "Abe Lincoln", with the double-quotes, will search for pages that contain both words next to each other, as opposed to one appearing in one place, and the second somewhere else. In a Google search box, the hyphen (minus - sign) means "ignore results that contain this word". 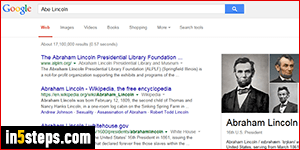 It's delimited by spaces, so if you type Lincoln -Abe Abraham, Google will interpret it as meaning "search for pages that contain the word Lincoln and the word Abraham, but not the word Abe" - not at all what we wanted! To find pages that contain the word Lincoln, but not the word Abe and not the word Abraham, you would type Lincoln -Abe -Abraham. Remember the double quotes? 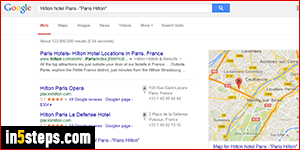 If you wanted to find pages for the Hilton hotel in Paris, but did not want to see the words "Paris Hilton" as an expression, you would type Hilton hotel Paris -"Paris Hilton". Notice the search results page in the screenshot: not a single celebrity picture in sight! The double quotes tell Google to treat whatever's between them as a single word, if you will. Let's now show you how to use the exclusion operator to tell Google to ignore results from one or more websites. Let's say that you're preparing your taxes, and that you're looking for tax tips, but you don't want to see results from the IRS website. Just add the minus sign to your query, the site: operator, followed by the domain to ignore. Look at the difference in results between the before and after. In the second case, not a single result from the site you excluded!